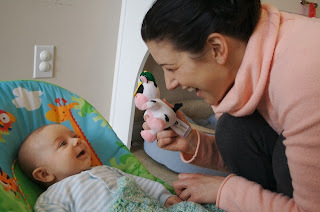 For my first blog entry, I am going to brag about the awesome streak we are currently having with Miles. Last night we took him to the mall and then out to dinner and he was so good! He slept most of the time and I even nursed him (in public!!) right at the table in the resteraunt. That's a big step for me as I haven't left the house without a bottle of expressed milk and that certianly makes for more prep time. Then we headed to our next destination for our hot Friday night out on the town: Babies R Us. Yes, life has certianly changed a lot for me and John! Miles continue to be so good and slept as we did our shopping. This may not sound like a big deal to you, but the evenings for the past month or so have been Miles' difficult times. Starting around 5 PM, Miles would usually get fussy and want to "cluster-feed." (That's feeding every hour or so for those of you not familiar with the term.) So every evening we usually brace ourselves for an adventure, but last night was pure bliss. While we waited for our table at the resteraunt we checked out some clothes at Macy's. I am so thankful that my pre-baby jeans and pants fit, but thanks to my new role as nursing mother, my old tops don't fit AT ALL. I currently have about 4 tops in rotation I can wear right now. When I went shopping, I found myself pretty lost. I haven't shopped for clothes (Maternity clothes don't count) in about a year, so I feel kind of clueless. I need to find my style again and start figuring out how to dress this new body of mine. If anybody has some shopping tips on where the good clothes for spring are, let me know. Back to our evening, once we got home, we fed Miles again, played a little and put him to bed around 11. He then slept for EIGHT hours!! We actually woke up refreshed and well rested! (This is where the bragging part comes in. It's really only sounds like bragging to other parents of newborns.) We spent the morning taking photos (as we usually do because the morning light is so great in our loft.) and just enjoying family time together. Here are some shots that we captured during the morning when the light is so great in our loft. 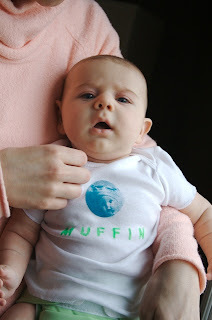 Our friend Sarah Collman made this adorable t shirt for Miles. Uncle Chris and Mark got Miles some gifts with a Texas country western theme, including this cow complete with a John Deer Hat and plays country music. Miles and I had a good time playing with it. 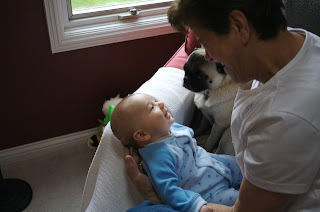 Grandma Smith came last week and always does a great job of spreading her attention evenly between Miles and Stamp. 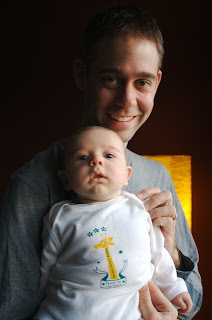 Here's John holding Miles in the onesie that the Turner Classic Movie gang gave to Miles when he was born. (Are they super nice, or what!?!) John should find out any day now if he made it in the top ten of the competition. So we put the outfit, that says "Reach for the Stars," on Miles for good luck. 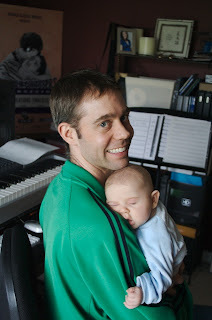 Speaking of John's work, here's John working in his office while holding Miles. John's getting pretty good at balancing baby and working the keyboard at the same time. It's almost 11 and Miles is in bed, so I think it's time for me to sign off. Thanks for tuning into my first blog entry! You go Bets! Thanks for taking time to document our adventure with Miles for everyone. I think this will be a great place to keep anyone interested up to date on the little one. Bets this is awesome! I haven't got to see Miles in so long and I have felt so out of touch. He is growing so fast and he really is a beautiful baby. Thanks for doing this.